Sea buckthorn oil is particularly rich in Omega-7 fatty acid, the importance of which for human health was discovered only in 2008. Among other few sources (concentration of Omega-7 in which is not as high though) of this fatty acid are the following: Australian macadamia nut, mink fat, whale fat and other similar exotics. Only recently scientists started to investigate a unique fatty acid that, unlike Omega-3 has not yet become a mainstream. Many useful properties of sea buckthorn plant were mentioned in the ancient Greek medical texts of Theophrastus and Tibetan books on medicine. And today, the unique properties of sea buckthorn plant and fruits and sea buckthorn oil in particular are supported by various scientific studies..
vitamin C (sea buckthorn oil contains significantly more Vitamin C than lemons and most of other vegetable oils). Various minerals, such as magnesium and zinc, phytosterols, bioflavonoids, phytoncides and many other beneficial substances. But the most outstanding feature of sea buckthorn oil is that it has incredibly high (23-31%) Omega-7 content. This concentration of Omega-7 is the highest among all known foods. Omega-7 is a monounsaturated fatty acid, which was discovered in 2008. The two most common omega-7 fatty acids in nature are palmitoleic acid and vaccenic acid. Sea buckthorn oil is one of the richest natural sources of Omega-7 in the form of palmitoleic acid. This fatty acid is synthesized in the body in the liver and adipose tissue. However, insufficient synthesis of this acid leads to the development of a number of pathologies. Omega 7 Reduces inflammation. This fatty acid plays an important role in preserving moisture in the mucous membranes of internal organs, such as the digestive tract, upper respiratory tract and others. According to a 2017 scientific study , Cis-palmitoleic acid (exactly this form is contained in sea buckthorn oil) “as co-adjuvant therapy for 8 weeks seems to decrease the inflammatory activity” and helps patients with ulcerative colitis. It was also discovered, that people suffering from ulcerative colitis or other inflammatory bowel diseases often have low levels of palmitoleic acid. Therefore, sea buckthorn oil is prescribed to them as part of a complex therapy. Skin moisturizing. Omega-7 keeps our skin hydrated and prevents it from losing its elasticity; it also protects your skin from premature aging. According to another scientific study made in 2017 , sea buckthorn oil contains “sterols, which strengthens the lipid barrier of the skin, protects from harmful substances of external origin and reduces the excessive water loss through the epidermis, thereby improving the skin elasticity and firmness”. No wonder, that sea buckthorn oil has become the latest “holy graal” ingredient in the quest for glowing, healthy skin. Weight Loss benefits of Omega 7. It is believed that Omega-7 is stimulating insulin and reduces insulin resistance of tissues and therefore it stimulates the body to stop storing excess fat. 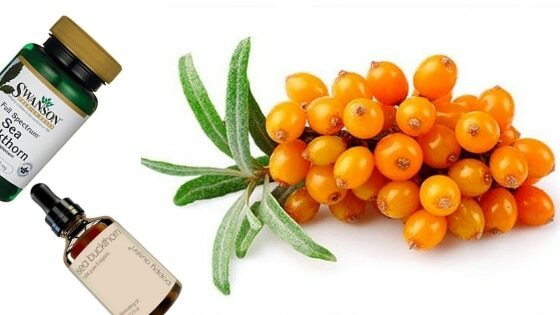 In this way taking sea buckthorn oil internal helps to prevent obesity. Currently, palmitoleic acid (as a component of sea buckthorn oil) is included in many weight loss programs. Prevention and treatment of a number of gastrointestinal diseases. Sea buckthorn oil is used in the complex treatment of the following diseases: gastritis with increased acidity of gastric juice, colitis, enterocolitis, gastric and duodenal ulcers, tumors in the gastrointestinal tract, esophagitis, gastroduodenitis, as well as fatty degeneration of the liver and cholelithiasis (not in the acute stage). Curing some eye diseases. Due to the very high content of carotenoids (including zeaxanthin), sea buckthorn oil is an excellent prophylactic against most eye diseases. It is used in the complex treatment of conjunctivitis, traumatic corneal lesions, eye burns. If you are willing to take sea buckthorn as a supplement, make sure to follow the correct dosage. Sea buckthorn is sold in two forms: 1) as either a dry plant extract (of which both the berries and the leaves are viable options) or 2) as an oil made from the berries (in liquid form or in a form of capsules). When taking dry extracts, the range of 500-2,000mg is used for both the berry extracts and the leaf extracts. For the oil, slightly higher dosage ranges (2,000-5,000mg) are used daily. If you prefer to consume liquid sea buckthorn oil, take one teaspoon (5 ml) per day, preferably 30 minutes before meals. Bolsoni-Lopes A, Festuccia WT, Farias TS, et al. Palmitoleic acid (n-7) increases white adipocyte lipolysis and lipase content in a PPARalpha-dependent manner. Am J Physiol Endocrinol Metab. 2013;305(9):E1093-102. Effect of Cis-palmitoleic acid supplementation on inflammation and expression of HNF4γ, HNF4α and IL6 in patients with ulcerative colitis. Minerva Gastroenterol Dietol. 2017 Sep;63(3):257-263. doi: 10.23736/S1121-421X.17.02367-4. Epub 2017 Feb 9.